When a cleric is the first of his faith, what would his relationship with his deity be like? This option gives the cleric charm-like powers of conversion and awards XP for building shrines and temples. This is a revision of an earlier post on optional clerical abilities. You can add these two abilities to specific clerics in your campaign or to all of them (if you wanted to have a campaign with strong competition amongst faiths). 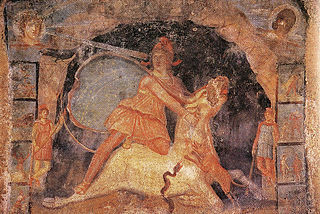 Mithras and the Bull: This fresco from the mithraeum at Marino, Italy (third century) shows the tauroctony and the celestial lining of Mithras’ cape. You were the first to dine with the Sun on midsummer’s day. As you feasted together on the sacrificial bull, the Sun Father gave you the mysteries of communing with the planets though sacred feasting. He initiated you as the first Friend of the Sun and commanded you to spread the mysteries to foreign lands, forsaking your home for now, but to return someday as a conqueror. Father Sun granted you the Voice that lets you perform miracles. As a prophet, you are the lone cleric of your faith. You must spread the word as quickly as possible ensure your deity is worshipped in the event you die while adventuring. You can convert others with your powerful oratory, which works similarly to a mage’s charm spell. These converts will become the basis of your congregation when you are ready to establish your own stronghold or abbey. Until you reach name level, you are rewarded with experience points for building smaller shrines and places of worship. Gamewise, this should function similarly to the magical research a mage performs between adventures. You are gifted with the ability to convert others to your fledgling faith through powerful oratory. Although strictly non-magical, your power of persuasion functions exactly as the charm spells magic users employ. Wisdom and Charisma bonuses both apply to your attempts to convert others. Converting a single person is possible at level 1, converting a monster comes at level 4. Mass Conversion of people is possible at level 6 and mass converting monsters begins at level 9. Converts’ spiritual allegiance is to the god or philosophy you represent and you are the focus of this new faith. This is mechanically simialr to a magic user’s charm spell, so read about your edition’s version of that spell to understand how it works. If a saving throw is successful, you will no longer hold the convert in a charm-like influence. You will still be respected and revered, unless the convert make a 20+ on his saving throw, in which case your faith has lost the convert completely. You also get XP from building shrines and small chapels, exactly as magical research works for magic users. Discuss your planned shrine with your GM. Describe the shrine, its purpose, miraculous properties, the artwork and craftsmanship you want, etc. The GM will then assign the cost and time necessary to create this shrine, as well as the reward you will receive. Be aware that if your shrine is desecrated within one year of dedication, you will lose the XP gained immediately and might even fall in level. So it is important to factor in the costs of upkeep and protection, or to hide the shrine well from unbelievers. If you and the GM can establish an equivalent magical item (if your game has standardized magic items) then it would be easy to establish the XP reward as that which you would get for obtaining it via combat or its coin value if you were to buy it locally.